Milena Karl one of the most successful German fashion bloggers- Better known as Milena le Secret is a dreamer who likes to travel and share it with her community. Her creativity allows her to share the new looks of the moment while preserving her own personality. From Hamburg to Dubai via Paris for a small croissant, Milena always reserves surprising trips for us. We at FIV were lucky to have an exclusive interview with Milena! FIV: Hello Milena! If you are on your Instagram account, you will soon notice that you travel a lot and share these trips with your followers. With all these journeys, you certainly have a place that has remained in your memory for a long time. What place is that with you and why? Milena: Yes totally and I wouldn’t miss it for a second. Every place is special and different in its own way, I can’t make up my mind, because you experience something completely different everywhere. I’ll just share my favorite place and this is PARIS. I’m actually super often and still in love every time. And on the day of departure I would like to extend my stay or book a new flight directly. FIV: You are not a very successful influencer without a reason. Especially in the field of fashion you are always up to date. Where do you get your inspiration for your looks? Milena: In magazines, on Instagram of course a lot and most of all when I myself stroll through the shops and on the streets!!! So always look around and perceive the surroundings. Especially in Copenhagen and Paris I always see so many inspirations. 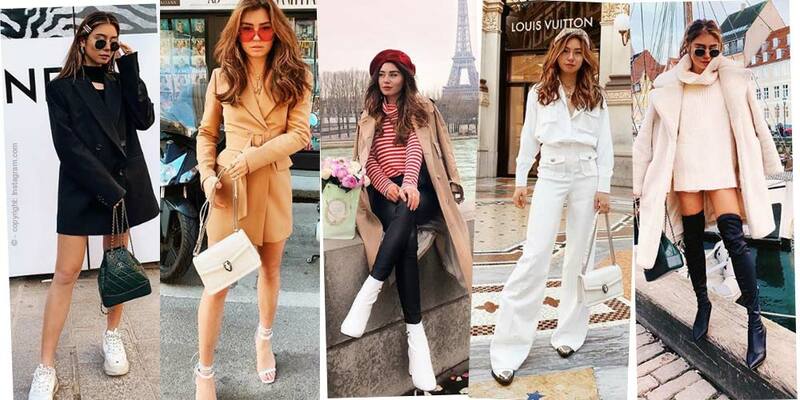 FIV: If you are involved in fashion like you are, you of course wear combinations every now and then which you might not wear in everyday life and thus show a lot of courage. How did you get so brave to just wear what you want, no matter what others say? Milena: It all came with age and time. You see more and you dare more. But I don’t have so many extravagant looks at all, but always look for my well-being, because then it always looks most authentic. FIV: Almost every day you post new inspirations for lifestyle, fashion and travel. Isn’t it a lot of work to get creative every day and as a blogger you have days when you just can’t remember anything? Milena: Fortunately creativity flows! Of course I also have down phases, but I would say I have a creative vein inside me and it always pulsates. So I even started with everything. FIV: Everybody knows, all beginnings are hard – but you’ve made it far with 565,000 followers on Instagram! But how did you actually start with your blog and instagram? Milena: I simply started to test the new photo app because I always liked to take photos. I’ve been busy with light and cities and love fashion above all! I had felt 100 magazine subscriptions and always cut out outfits. I always asked my dearest mommy if she could take an outfit photo – called #ootd today. That I then edited on Instagram and uploaded. That’s how it all started. FIV: You are young and pretty, so it’s normal to have dates! But because a lot of people know you, it’s a lot harder to get to know someone normally. What is it like to date someone or just get to know someone when you are known? Milena: Well, I forget that a lot. I don’t feel any different or “known” at all and I am still in my skin. So I’ve been a little more reckless there – been! Sometimes you get stupid sayings, sometimes there are especially excited interested people. But I think it doesn’t matter, because when the spark goes off it doesn’t matter who is who. Then it just sparked and the conversation is not at all about Instagram, or über´s Bloggen. FIV: With your Instagram account and your blog you can see that you are busy with beauty, fashion and travel. If you had to choose one of these things for the rest of your life, it would be beauty items, stylish clothing, or traveling the world? Milena: More like clothes! With the right outfits I also have the right feelings and charisma. With a broad smile on your face you don’t need make up!